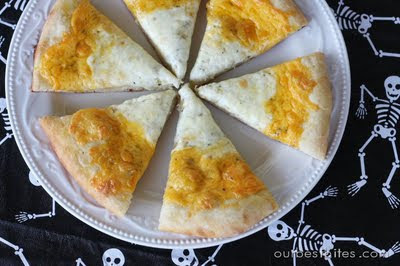 A ring of mozzarella and a ring of cheddar turn an ordinary cheese pizza into candy corn pizza. My kids will loooove this - thanks so much for sharing!! I am so trying this tomorrow! Thanks. Your ornaments turned out really cute by the way. That is fantastic...I cannot wait to make it for the kids - they will love it. Isn't Sara fantastic? I went to church with her when we were teens... I'm AMAZED at all the stuff she comes up with! heh...I guess it goes without saying, if Myrnie was in Sara's ward, then I was, too. Heh. But she IS brilliant!